We love to find useful items for the home. One of our favorites is the Holly & Martin French Country Sideboard. This country bookcase with drawers is both perfect as a sideboard for that Sunday brunch, or to use as a bookshelf organizer! 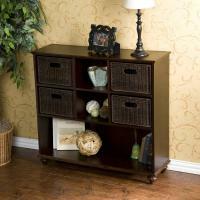 With two small display areas and one large bottom shelf, you are sure to utilize all that this piece has to offer. Additionally, the four warm espresso rattan drawers can hold an ample supply of utensils, accessories, books or even toys! For more details visit www.cheapchicdecor.com.